LOS ANGELES, CA (December 12, 2017) American Ballet Theatre (ABT) hosted its annual Holiday Benefit dinner and performance, December 11, 2017, at The Beverly Hilton Hotel, Beverly Hills. This year’s benefit, sponsored by Harry Winston Inc., honored Judy Morr, Executive Vice President of Segerstrom Center for the Arts. Co-Chairs of the Holiday Benefit were Sarah Arison, Avery and Andy Barth, Lisa Love, Michael Moser, Elizabeth Segerstrom, Stewart Smith and Robin Ferracone and Sutton Stracke, and the Junior Co-Chair was Hannah Selleck. The evening featured a one-night-only performance by the world-renowned artists of American Ballet Theatre, including Principal Dancers Stella Abrera, Misty Copeland, Gillian Murphy, Hee Seo, Daniil Simkin, and Cory Stearns, in scenes from the Company’s repertoire, followed by a post-performance dinner and dessert with the dancers. The Holiday Benefit performance included excerpts from works by choreographers Benjamin Millepied, Alexei Ratmansky and Christopher Wheeldon, as well as scenes from the Company’s most treasured classics, The Nutcracker and Swan Lake. The performance also included a first look at Ratmansky’s full-length ballet, Harlequinade, which will have its World Premiere during ABT’s 2018 Spring Season at the Metropolitan Opera House. Judy Morr, Executive Vice President, Segerstrom Center for the Arts, was honored for her dedication and service to dance and the performing arts community. Morr joined Segerstrom Center in 1985 as general manager, prior to its 1986 opening. Under Morr’s guidance, Segerstrom Center has earned a reputation as one of the most important centers for dance in the United States, enjoying the respect and admiration of dance companies, performing arts organizations, and critics around the world. 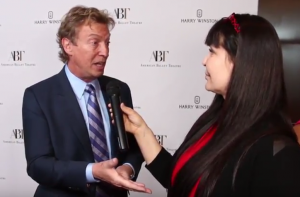 In 2015, Morr was instrumental in launching the American Ballet Theatre William J. Gillespie School at Segerstrom Center, which combines the resources of ABT, America’s National Ballet Company, and Segerstrom Center, one of the world’s leading presenters of dance. The ABT Gillespie School offers unrivaled opportunities for training and nurturing future generations of dancers and dance audience and furthering the development and evolution of dance. The school carries the name of Orange County philanthropist William J. Gillespie, a board member of ABT since 1999 and an enthusiastic and generous donor to the Center for much of the institution’s history. American Ballet Theatre will present its annual engagement of Ratmansky’s The Nutcracker at Segerstrom Center for the Arts in Costa Mesa, featuring students from ABT’s William J. Gillespie School, December 7-17, 2017. For tickets, please visit http://www.abt.org/performances/nutcracker.asp or call (714) 556-2787. Proceeds from the Holiday Benefit support American Ballet Theatre and its educational programs. American Ballet Theatre has been home to many of ballet’s legendary stars – Mikhail Baryshnikov, Natalia Makarova, Alessandra Ferri, Julio Bocca, Paloma Herrera, Angel Corella, Julie Kent and Ethan Stiefel to name a few– and is renowned for its lavish productions of full-length ballets including Swan Lake, Giselle, La Bayadère, and Romeo and Juliet. With a Company of 90 of the world’s most celebrated dancers, ABT performs for audiences of more than 400,000 each year in New York City, Southern California, across the United States, and around the world. On April 27, 2006, by an act of Congress, American Ballet Theatre was named America’s National Ballet Company®. Founded in New York City, in 1932, The House of Harry Winston continues to set the standard for the ultimate in fine jewelry and high-end watch making. From the acquisition of some of the world’s most famous gemstones, including the Jonker, Hope and Winston Legacy Diamonds, to adorning Hollywood’s leading ladies on the red carpet, for over eight decades, Harry Winston has been a symbol of the best there is. Headquartered in New York, the company operates retail salons worldwide, in locations including: New York, Beverly Hills, London, Paris, Genève, Rome, Tokyo, Hong Kong and Shanghai.